In an op-ed recently published in Foreign Policy, I write about the legacy of former Secretary-General Kofi Annan at the United Nations. Kofi Annan, who died last weekend, was arguably the most consequential United Nations secretary-general since the second, Dag Hammarskjold, who served in the 1950s and 1960s. Unlike the dashing Swedish diplomat, Annan was an organization man, the first to rise through the UN’s own ranks to its highest position. And yet he used his knowledge of the UN system, and his dignity, to good effect, becoming an eloquent advocate for a flawed organization and embodying the conscience of what some hopefully call “the international community.” His tragedy was to occupy his post during the greatest crisis in the troubled history of U.S.-UN relations—namely, the run-up to the Iraq War and its turbulent aftermath. Although his tenure ended in disappointment, he will be remembered for his defense of humanitarian intervention, his advocacy for UN peacekeeping, and his insight that security, development, and human rights are inseparable. Annan was the first UN secretary-general from sub-Saharan Africa. He was plucked from relative obscurity by the Clinton administration, which was determined to deny a second term to Boutros Boutros-Ghali, an acerbic and imperious Egyptian who had alienated Clinton administration officials, not least Madeleine Albright, then the U.S. ambassador to the UN. But Annan’s selection was not without controversy. As a senior official in the UN’s Department of Peacekeeping Operations, he had been involved in the decision not to reinforce the beleaguered UN mission in Rwanda in 1994, with catastrophic results. Annan would learn from that searing experience, as well as from genocides in the former Yugoslavia. 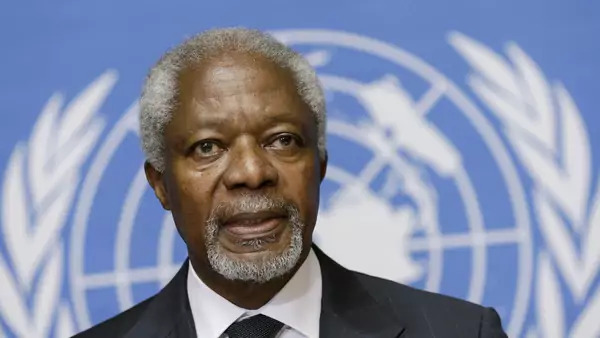 Appointed to his first term in January 1997, Annan helped pioneer a principle that would become known as “the responsibility to protect,” or R2P. Read the full op-ed originally published in Foreign Policy.